Welcome to the online help for the LTO Flash! User Interface Software (LUI) (Version 1.0)! This documentation describes the software's features and guides you through the process of putting Intellivision ROMs onto your LTO Flash!–and more! Initially released for use with the LTO Flash from Left Turn Only, the software behind LUI is designed with the true Intellivision fan in mind. Not only does LUI provide an easy-to-use "front end" for managing your LTO Flash, it is useful for tracking your Intellivision ROM collection. It also ships with support for the original Intellivision Cartridge Emulator–The Intellicart! Future updates to the software are planned that will not only fix bugs (blush), but also add new capabilities. Sending your Menu Layout to LTO Flash! In a hurry to use your LTO Flash!? Here's a minimal guide to get you up and running as quickly as possible. The Quick Start assumes you've already downloaded the software and know how to run "unsafe" programs downloaded from the internet. When the ROMs have been added, plug your LTO Flash! into your Intellivision console–you're done! 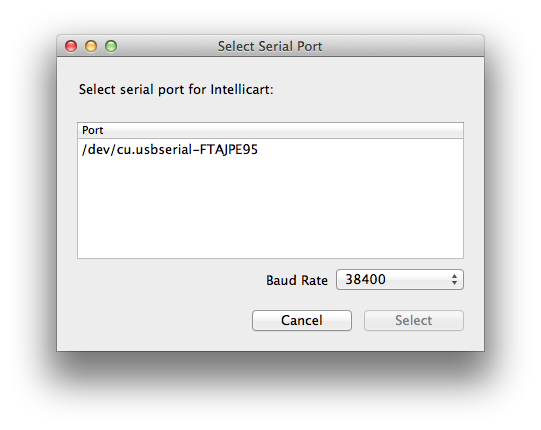 For MacOS X 10.9 and later, we recommend using the native FTDI drivers Apple provides with MacOS X. 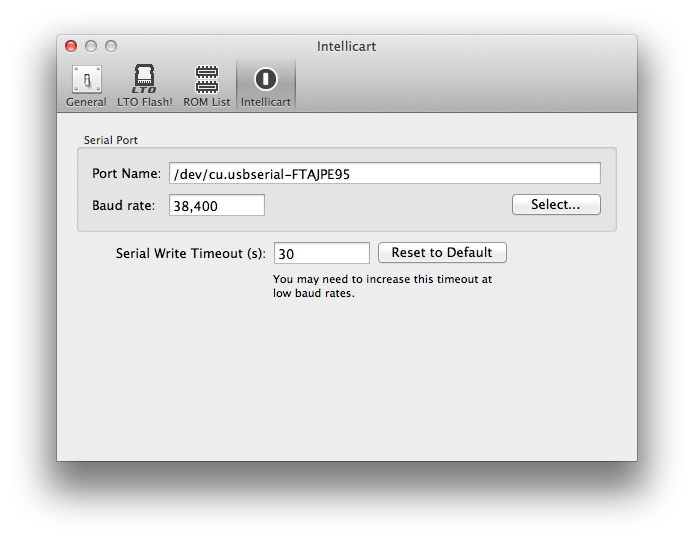 For MacOS X 10.7 and 10.8, install the latest FTDI drivers from FTDI's web site if necessary. FTDI's drivers have minor stability issues unrelated to LTO Flash! We recommend using the Disconnect button before unplugging your LTO Flash! to avoid an unexpected reboot of your Mac. The LTO Flash! User Interface (LUI) software for Mac OS X requires the Mono framework, version 4.0 or later. The main page for this can be found here. You can download the installation program for Mono here. If you have not already installed Mono, you will be prompted to do so when you launch LUI. To be able to communicate with your LTO Flash!, you may also need to install the Virtual COM Port (VCP) driver software from FTDI. This driver software enables your computer (and LUI) to communicate with your LTO Flash!. NOTE: During testing, it was found that in Mac OS X 10.8 and earlier, due to driver stability problems, the computer would (rarely) crash when unplugging LTO Flash! from the USB port. This has since been revealed to be a known problem with the FTDI drivers, and is not specific to LTO Flash!. Installing the LTO Flash! User Interface software is simple! Download the disk image and unzip it. Double-click the LTO Flash! Disk Image (.dmg) file to mount it. Drag the LtoFlash.app program onto the Applications folder (or anywhere else, if you're a rebel). The first time you launch LUI, if the Mono framework has not previously been installed on your system, you will be prompted to download and install it. Simply follow the prompts. Alternatively, you can visit the main page for Mono for Mac OS X here. You can download the installation program for Mono here. A complete installation guide can be found here. This section offers a quick overview of the most important features. You can find complete documentation here. This section offers a quick overview of the basic parts of the user interface. You can find complete documentation here. The Menu Layout Editor: Arrange your ROMs for use on your LTO Flash! Along the top of the screen, like all Mac applications, you will see the menu bar for LUI when it is the program you're interacting with. All the features available in LUI can be accessed via the menu, including those shown in the toolbar. As you become familiar with the application and its menus, you may find yourself using the keyboard shortcuts more and more often and relying less upon the toolbar. In addition to the menu and primary work areas, you will use the features located along the top of the main window. This part of the user interface is called the "Toolbar". The most commonly used features of LUI appear in the toolbar. LUI provides a convenient location to keep track of the ROMs in your collection. Simply drag ROMs from your file system into the ROM list, or click the Add Files or Add Folders button. Note that although LUI does attempt to ensure that only valid Intellivision ROMs are in the ROM list, because the .bin and .rom file extensions may be used for other types of files as well, it's possible that some files that are not ROMs will be included in the list. If this happens, simply delete the items from the ROM list. Because the .rom format for Intellivision ROMs has a well-defined format, LUI will only add files whose contents appear to adhere to the standard. When you add ROMs to the list, you will be prompted to decide whether any newly added ROMs should also be added to your Menu Layout. This makes populating not only your ROM list, but also your Menu Layout, quick and easy. If you're adding an entire directory of ROMs to the list, directories in your Menu Layout will be added in a corresponding fashion. Thus, the on-disk organization of your ROM library will be reflected in your Menu Layout. Note that when you delete a ROM from the ROM list, it is merely removed from the list. LUI never modifies or removes any ROMs from your computer. Simply drag and drop ROMs from your ROM list into the Menu Layout Editor to create a Menu Layout for your LTO Flash!. In the Menu Layout Editor, you can set a "long" name (up to 60 characters) and "short" name (up to 18 characters) for each ROM. You can also assign a color for each menu item's icon. To save some time, you can select multiple items in the ROM List by using the same keys you would to select multiple files in the file system. Using Shift will select all the items between the currently selected item and the next one you click. Using the Command key will select items individually. Use the New Directory button to create a hierarchy of menus to arrange your ROMs as you see fit. Feel free to put the same ROM in as many different menu locations as you wish. The file system on LTO Flash! avoids making unnecessary copies of the same ROM. To arrange your menu items, simply drag and drop them to put them in the desired order or into different directories. To delete an item from your menu, click it and use the Delete key on your keyboard, or, click the Delete button in the Menu Layout Editor, or, click the button in the Toolbar, or right click on the item and choose Remove from Menu. The LTO Flash! delivers the most advanced cartridge platform for the Intellivision to date. Not only can you use LTO Flash! to bring all your games into one convenient cartridge, it can work around common incompatibility problems, too! Do you long to show your friends the tragedy of the original Coleco version of Donkey Kong, but only have an Intellivision II? Lament no more! LTO Flash! fixes the incompatibility! Or, do you impress your coworkers with the prescient power of your Intellivision ECS setup—with Intellivoice and Music Synthesizer installed—but find the process of disconnecting everything to show them how great the Atarisoft version of Pac-Man is? You're covered! LTO Flash! also addresses common ECS compatibility issues. LUI provides access to all the advanced configuration features of LTO Flash! as well as other powerful utilities. NOTE! If your LTO Flash! is also plugged into your Intellivision console, the power to the console must be turned off in order to update the contents of your LTO Flash!. The user interface should prevent you from attempting to do this if such is the case. One especially useful feature for game developers—or simply as a means to quickly try out a work-in-progress ROM—is the ability LUI provides for you to quickly Download & Play a game. Simply have your LTO Flash! connected to your computer and your Intellivision. With LTO Flash! plugged into your console with the power on, and at the menu screen (not playing a game), select a ROM from the list and press "Play"! If you have not already added a ROM to the ROM list, you can also browse for to the ROM file on your computer from LUI and immediately download and play it using the Browse & Play feature. If you connect your LTO Flash! to another computer and install the LUI software, you can also import your menu layout and ROMs from your LTO Flash! into LUI. After installing and launching LUI on the computer, connect your device and choose the Get from LTO Flash! command. When you use this feature, any ROMs not already in your local ROM list, but on your LTI Flash!, will be added to your ROM list. NOTE: If you already have a menu layout defined on your computer, it will be replaced! You will be reminded of this. If you wish to make backup copies of the contents of your LTO Flash! LUI offers the ability to extract the contents of your device. Later, you can use the data backup to restore the menu layout and contents of your device to the same state. Your LTO Flash! is field upgradable! If a problem is found, or, more likely, new features are added, you can simply download a firmware update and use LUI to easily apply the changes using the Update Firmware feature. Many Intellivision fans have enjoyed playing their ROMs on real hardware ever since Chad Schell shipped the Intellicart! Intellivision Cartridge Emulator back in 2000. Nearly all of the original titles, and a large majority of newer titles, can still be played on the Intellicart!. The download program that made it so easy to use has not been updated for newer operating systems. In appreciation for the groundbreaking work accomplished with its release, LUI includes the ability to download ROMs to an Intellicart!. Most modern computers no longer have a standard D-sub 9 (DE-9/DB-9) COM port, but inexpensive USB-to-Serial adapters, such as this one, can be used to connect to your Intellicart!. If you haven't gotten LTO Flash! yet, or simply wish to relive the nostalgia of using the original Intellivision cartridge emulator, don't fret about locating the download software. It's here!